Ok, I know I’ve been neglecting my blog for the past few days, but this is the busiest period in the school year. 3rd year students just graduated, and the 1st and 2nd year are going through their finals. At least, the teachers got treated to an expensive bentou after an excruciatingly long graduation ceremony. Some of you might wonder why I didn’t post about my trip to Okinawa on this blog, and the answer is simple: because it was hell! It was hell because I was working from 5:30 in the morning to 1:30 the next morning (that’s right, I couldn’t really sleep more than 4 hours a night), looking after the students in between teacher meetings, patrolling the hotel halls, standing next to cigarettes vending machines, and writing daily reports for the school. Like that wasn’t enough, we the teachers had to eat most meals in ten minutes, and it was raining cats and dogs for half of the trip. The people were very nice, though, and I sure want to go back someday, for leisure off course. 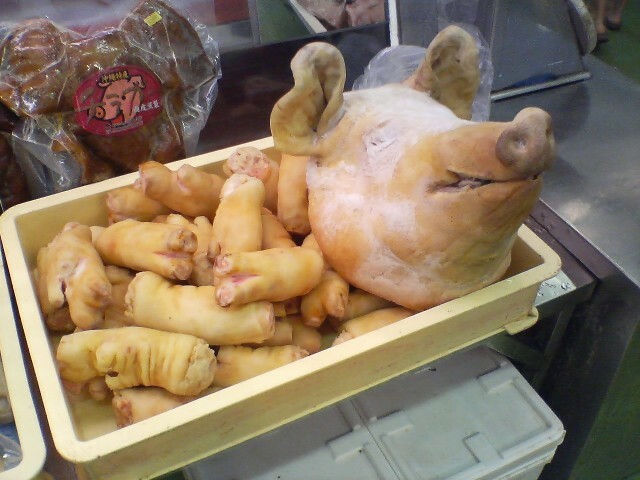 Talking about Okinawa, the most common meat there is pork, as you can see in this picture from a market I went to.